Brighton & Hove is surrounded by many areas of Open Access land available to enjoy on foot. Much of this land is crossed by rights of way and other paths. Combined, the areas total 650 hectares (1600 acres) managed for local wildlife and people. Open Access allows people to roam anywhere across the land, except where there are farmed crops. Please observe signs and follow the Countryside Code. Over 220 hectares (545 acres) of this access land is statutory "open country" mapped under the Countryside & Rights of Way (CRoW) Act. This is the highest percentage of the total area of any local authority in South East England. 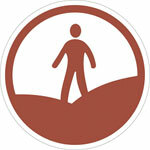 Maps of Countryside & Rights of Way Act access land can be found on the Natural England website. For practical reasons some areas of access land in East Sussex can only be reached via Brighton & Hove. The area is 282 hectares (670 acres), roughly ten times the size of Brighton’s Preston Park. It adjoins existing Open Access land the council created in and around Stanmer Park in 2006. In addition, Eight kilometres (five miles) of new footpaths and bridleways have been created, through rolling grassland. The ability to roam off paths means walkers on the Sussex Border Path can divert onto a route which keeps them further away from the busy A23. The landscape includes the Chattri monument to Indian soldiers who died in the Royal Pavilion hospital from First World War injuries. Other features are ancient burial mounds on top of Tegdown Hill – evidence of long use of the landscape by humans. The names Tegdown Hill and Ewe Bottom echo its history of sheep farming - tegs being young sheep. Also clearly visible are lynchets - terraces formed by ploughing dating back many centuries. Works have involved installing a large number of gates and cutting a new path up a steep bank at Braypool.